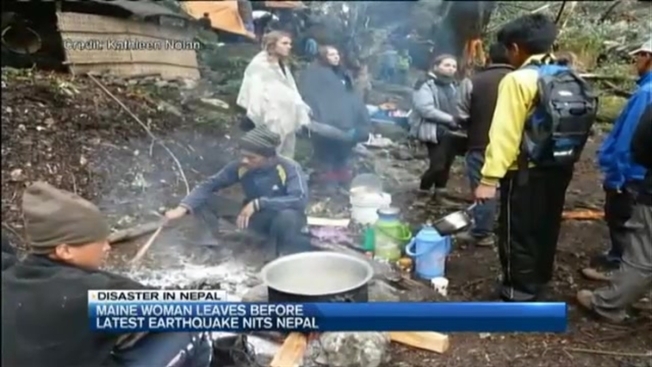 A Maine woman says she is lucky to be alive after surviving the first earthquake to hit Nepal in April -- and even more fortunate to have escaped the country before the second quake hit Tuesday. Kathleen Nolan was trekking through the Langtang Region of Nepal when the first earthquake happened. She was forced to dodge falling rock and drink river water for days to stay alive. "I just figured, OK, this is it," said Nolan. "And there certainly were some people that did die right on that very trek." After days stranded on the trail, Nolan was able to climb aboard an Israeli helicopter and fly into Kathmandu. One week after the initial quake, she made it back to her home in Kennebunk, Maine. "I just feel lucky that I survived the first one," said Nolan. When she heard the news that another earthquake had hit Nepal Tuesday morning, her heart sank. "I just cried, because the country is devastated and I can't imagine how they are going to recover," she said. Nolan had made many friends in Nepal from her two hiking trips. She has been checking on them, and everyone she has been able to make contact with is in good condition physically. Mentally, and emotionally, they are suffering. "I think they had just gotten comfortable, thinking we were going to be okay," said Nolan. "The terror that they're feeling, I just can't even think about it." Nolan stressed the importance of providing relief aid for Nepal's immediate needs, but also helping them rebuild in the long-term. "They're resilient, but they've been dealt a very rough hand at this point," she said. Nolan plans on returning to Nepal in the near future -- not to trek, but to do volunteer work and help rebuild.